Albert Schweitzer said, "The purpose of human life is to serve and to show compassion and the will to help others." As we transition from one national administration into a new administration, I hope that we remain mindful of this as a national cause. 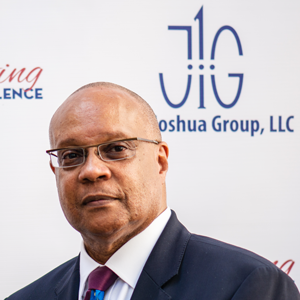 As 1Joshua Group enters our 14th year, we are taking the time to review our impact across the industries we serve. We are pleased to have participated in two of four HBCU medical schools' presidential inaugurations. Our work with the 50th Anniversary of Surgeon's General Report on Tobacco accomplished more than one million impressions. Working alongside of one of our longstanding clients, we participated in the production of scholarly and community engagement programs around precision medicine, specifically increasing the awareness of Mrs. Henrietta Lacks and the HeLa cells — about whom a movie will debut in April of this year. We are honored to support a program where the longest serving university president will be honored in a 10th anniversary Health Disparities awards program. Production of programs for our clients have taken us to the Caribbean in the engagement of the 20 Caribbean Community countries (CARICOM) to address issues around aging and cardiovascular disease, and in Jamaica to strengthen the educational infrastructure around teaching. Most importantly, a newly established initiative around creating better prepared HBCU graduates for health and science careers is undergoing tremendous growth as it addresses student debt, critical thinking, test taking strategies and the cultural implications of education and learning. Our involvement with clients to address organization development and strategic planning continues to increase. Serving as "of counsel" to our pharma clients helps us work to integrate interprofessional and interdisciplinary opportunities to improve life and health outcomes. We are so excited about the positive impact of our past performances. We are hopeful that our journey into the future will be as beneficial to those we serve. It is in that hope and change that we are encouraged. In uncertain times, we continue to believe in the good of humanity; and that good overpowers that which is not good. Happy New Year. God Bless America! Our team wishes for each of you a joyous and peace-filled holiday season. As you prepare to continue in this season of fellowship and set goals for the new year, don't forget that we can assist you with creating cost effective solutions, measurable strategies, and positive outcomes in Strategic Communications, Marketing/Public Relations, Professional and Consumer Initiatives/Programs, Program and Event Development/Management, and Association Management. Give us a call or send us an email — we listen. We work with our clients to join what you know with what we have learned for a product that achieves the best of your expectations. Several tragic incidents over the past month emphasize the importance of respect for each other. I am reminded of the instructions of my awesome grandmother that we should “do unto others as we would have them do unto us,” the golden rule. Yes, life matters. All lives matter. But it is evident that some lives are valued less than others. There are not many words that address this travesty that you have not read or heard. We here at 1Joshua Group want to add our prayers and condolences to the families whose losses are deep, painful and senseless. We add our voice to eliminate the silence, ask all of our leaders for a call to action and an action to make justice prevail in these injustices. We add our voice to our fellow Americans and those around the world to seek justice with civility, safety and reason. We are prayerful for a better America and a better world. Some progress has been made. There is a tremendous need for more progress in economics, educational attainment, improved health status and all of the determinants that create a beneficial quality of life standard. We ask that each of you continue to make your contribution to this better world. Be assured, 1Joshua Group will continue to do our part to make this a better place for all lives, because all lives matter, including Black lives.